Dahlak Restaurant, 2007 State St., just south of I-90 off Rainier Ave. S.
Patience Chaitezvi was born in the town of Bindura, Zimbabwe, and is the sixth of nine children. She grew up immersed in traditional music as her mother is a traditional healer and spirit medium who requests that mbira music be played in her healing sessions. Patience learned to play mbira by watching her older brother play, and began performing in bira ceremonies for ancestral spirits when she was in the sixth grade. One of few women mbira players in Zimbabwe, Patience holds a BA in Divinity with a specialty in comparative religion; she has detailed knowledge of the contrasts between Christianity and other world religions, and traditional Shona religion. Completely bilingual, she is currently a high school teacher in the town of Chinhoyi and enjoys sharing her culture as well as her music. 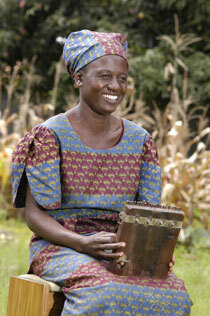 Patience first toured the United States in 2008 with the all-women mbira group Vakaranga Venharetare: Women of the Spirits. This is her first visit to Seattle. Is a place to go and listen and dance to the best African & World Music.